This part of the coast is also known as the Riviera dei Fiori (flowers). Flower-growing is a major activity in the area (there's a famous national flower market at Sanremo), but with the climate here they don't seem to need much help. The flowers, especially the bougain­villeas, and the sea and the palm trees are the lasting images of the area. 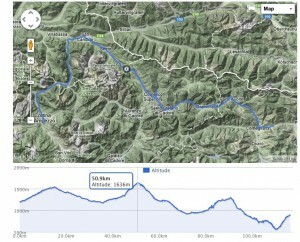 This stretch of the tour is mainly flat - although expect some short climbs between the different bays. 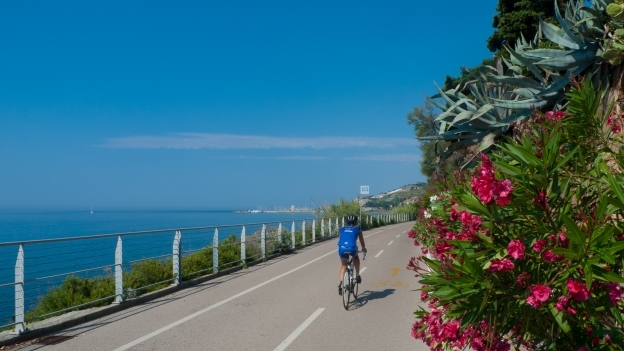 It also includes two sections of cycleway following the old train line along the coast: the Cycling Riviera (Parco Coast Ponente) which runs for 24 kilometres between between Ospedaletti and San Lorenzo al Mare and the cycleway and another that runs for between 9.6 kilometres between Arenzano and Varazze. In addition there are a number of old towns along the coast that are worth a short detour including the centre of Ventimiglia, Finale Borgo, and Cervo. If you are coming from France and you have the time you might also want to stop for a visit to the Hanbury Gardens near Bordighera. Coming over the border the Boulevard de Garavan (D124) offers a quieter altern­ative to the main road. Alternatively you can take the Avenue Aristide Briand (D6007). These allow you to avoid three tunnels on the main via Aurelia (SS1). Just outside Ventimiglia you turn off the main road (just before another tunnel) and follow a very quiet and scenic road, named after the famous conductor Toscannini, taking you into Ventimiglia. It's well worth making the short detour to visit the old medieval part of the city, before picking up quiet road along the lungomare (seafront) taking you out of town towards Bordighera. Bordighera was once practically a British colony with over 3,000 British residents, with a church, theatre, newspaper and of course a tennis club - Italy's first. The stretch along the coast past Bordighera is a zona traffico limitato. The beaches here are gravelly rather than sandy, but enjoy the open views of the sea and the mountains while you can. Sadly you have to leave the lungomare for a short stretch of main road taking you into Ospedaletti, but the best is still to come. At Ospedaletti the seafront cycleway (pista ciclope­donale) takes you to the old station where the Cycling Riviera (Parco Regionale del Ponente) cycleway starts. (Note: the 4 kilometre section from Ospedeletti is due to open in March 2013). The cycleway is 24 kilometres of pure bliss: a restored old railway line running for most of its length along the sea shore, beauti­fully landscaped and intel­li­gently designed. There are some section of tunnel offering a welcome interval of coolness on a summer's day. 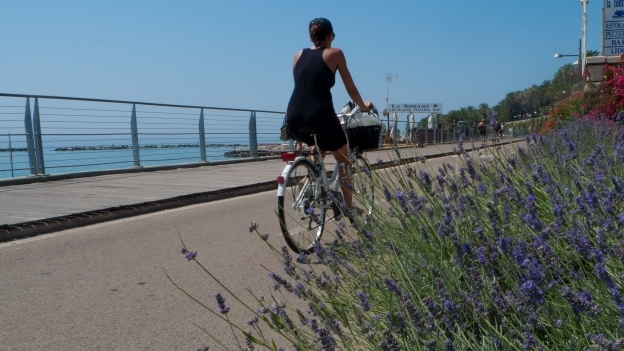 The cycleway has given a new lease of life to Ospedeletti itself: 120 years it was cut off from the sea by the railway line, and a 4-metre stone wall. Now the line, and the wall are gone, and Ospedaletti is enjoying being a seaside town again. The fact that much of this section of coastline was cut off from the railway line means that it remained unspoilt. The cycleway ends at the old station at San Lorenzo al Mare. From here it's back onto the main road for another brief run of about 6 kilometres to the edge of Imperia. Imperia was the name given by Mussolini's government to the twin towns of Porto Maurizio and Oneglia. Both names however continue to exist on the map and both have their own rail station. If you are travelling north-south then you should be able to follow the shore road that leads into the centre of Porto Maurizio and from there to Oneglia where you can pick up the cycleway along the harbour-side where little fishing boats are moored next door to huge luxury yachts. The cycleway leads to a very quiet road that follows the coast - it's quiet for a reason: about halfway along the road has been cut by a landslide. The road is still passable on foot and by bike. Once past the landslide, continue into Diano Marina. 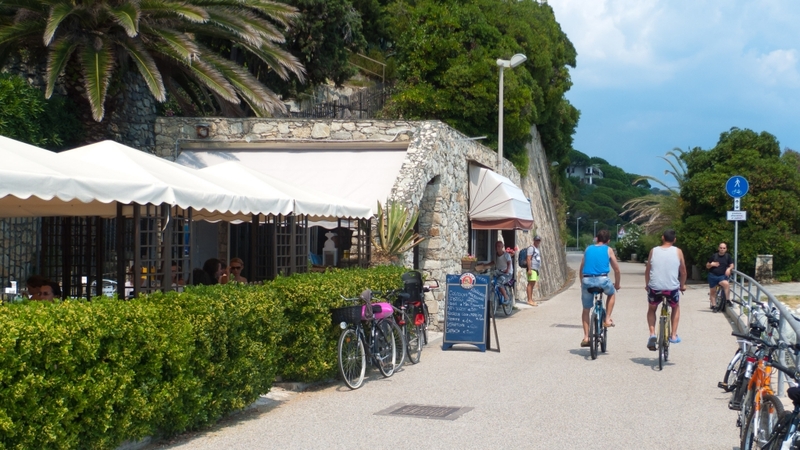 Diano Marina is well worth a stop and a brief detour into its traffic-free centre with cafes and restaurants (NB traffic-free in this case means you have to park your bike or push it). Beyond Diano Marina is one of the areas jewels the town of Cervo with its gorgeous Baroque church of San Giovanni Battista (St John the Baptist) high on the hilltop. 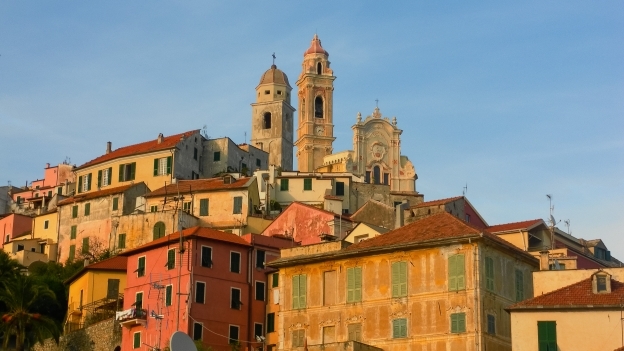 After Cervo the tour takes you through a series of seaside resorts including Alassio. Alassio like Bordighera once had a large British population and also has its tennis club. After the war it became a resort for the glitterati including Ernest Hemingway. Hemingway was one of the customers at the most stylish bar in town the Bar Roma. One night, the owner of the cafe, with Hemingway's encour­agement, came up with the idea of getting his famous customs to sign a ceramic plaque and displaying them on a nearby wall. Hemingway's signature was one of the first to appear on the wall: other names you may recognise include Louis Armstrong, Anita Ekberg, Jean Cocteau, Vittorio de Sica, Fausto Coppi, not to mention Eric Sykes and Max Bygraves. The one-way system makes getting to the muretto, and from there to the main road a little awkward. If you're not bothered about seeing the muretto, you may want to turn onto the main road a little earlier. From Alassio the route continues with sections on the main road altern­ating with sections on the lungomare through the towns. The sections of main road are very scenic though, which is a compens­ation for the extra traffic. Perhaps the most scenic stretch, is around Noli, and the Capo di Caprazoppa (which trans­lates as lame goat). From Savona to Genova, again, the story is a great cycleway between Varazze and Arenzano (9.6kms) mixed with main road. The turning for the cycleway between Varrazze and Arenzano is easy to miss (I didn't see any signs). The turning is on the left just after the Q8 petrol station, turn left and then bear right onto the Lungomare Europa which goes under the main road and the cycleway starts a little way after. If you see a building on the sea side of the road with a large 'Nautilus' sign on the roof, then you've missed the turning. From Arenzano there's a stretch of scenic road to Voltri, which really marks the outer edge of the Genova conurbation. 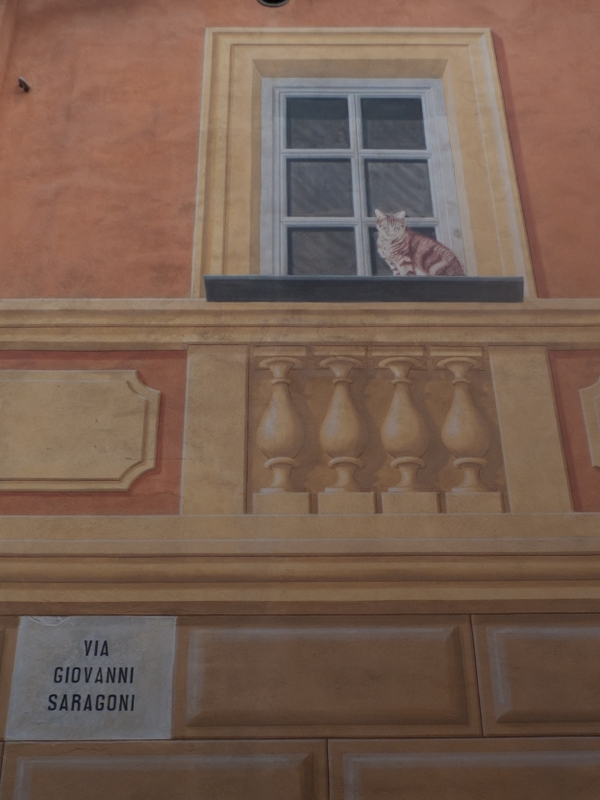 Genova has a huge container port and airport on its norther/​western side, as well as the railway line, so this section is likely to be partic­u­larly busy. There are other options for going through the centre of town but none of them seems much better than the simple option of following the main road. At Sampierdena the through-traffic turns off onto an elevated expressway (off-limits to bikes) the road from here gets a calmer although when I did it there was still quite a lot of traffic about. The route takes you past the old harbour. If you have the time you can explore the old city or the new Museo del Mare on the dockside and the aquarium (Acquario di Genova). There is in theory a cycle path along the harbourside, but when I was there a combin­ation of market stalls, and street traders made it imprac­tical. One piece of advice if you are heading towards Genova: bear in mind that during the summer these roads can get very busy at weekends as people head back from a day at the beach. In the centre of Genova the Strade Nuove and the the Palazzi dei Rolli have been declared a UNESCO World Heritage site. This area is a very short distance from the harbourside, mainly along the Via Balbi, Piazza della Nunziata, Piazza della Zecca, Via Cairoli, Via Garibaldi and Salita Santa Caterina. There's a good overview on visitgenoa.it: Strada Nuova and a more detailed site here: rolliestradenuove.it/. . There are some pictures on whc.unesco.org. the Via del Mare from Imperia this forms part of the Bicitalia Svizzera-Mare route. the Via Pedemontana from Savona. See the Liguria cycleways and cycle routes for more inform­ation. While it's not an official cycle route, the SS 456 which leads from Voltri towards Ovada and Acqui Terme in Piemonte via the Passo di Torchino (536m) may also be an option worth consid­ering. If you wanted to avoid Genova you could head inland on one of these routes and connect with the Ciclovia Francigena (until recently called the Ciclovia dei Pellegrini) near Busalla. From Genova the official route heads inland towards Uscio and the Valle Fontebuona where it links up with the Ciclabile dell'Ardesia. It's quite a big detour and I'm not sure that it's worth it: if you can live with the traffic on the coast road I'd continue along the coast. There are lots of campsites along the riviera - although quality and prices are variable. Sites along the coast itself can often be expensive and crowded - inland sites may offer a better deal. I've stayed at the Camping Tahiti in Finale Ligure which was a decent friendly site with a nice terraced area for tents. I've also stayed at the Camping Edy near Diano Marina - when I was there it seemed to be turning into rapidly into a bungalow park, although there was still plenty of space for tents. You will always be within easy reach of a train station. Ventimiglia offers connec­tions to Nice as well as the inter­na­tional train via the Tenda to Cuneo. There are also frequent services along the coast to La Spezia and Pisa. At Savona you can catch a ferry to Bastia in Corsica. Genova offers ferry connec­tions to Corsica, Sardegna, Sicilia, Barcelona and Tunis.